In How to Be Thin in A World of Chocolate Michele Connolly shares her strategies of how to lose weight while at the same time keep, or even increase, your sense of pleasure in life. Not to mention your sanity. Using simple and practical strategies Michele helps you work out ways you can enjoy your treats, make exercise happen without thinking, avoid self-sabotage and focus your mind on the job at hand without rigorous discipline and willpower. Michele Connolly loves food. She loves burgers and pizza, waffles and chocolate. She likes to dine out and if there are two desserts that sound great, she will order both. She regularly has wine and cheese for dinner. She is not someone who would willingly dine on salad. She doesn't count calories or exclude food groups or go on fad diets. She is not Paleo. She doesn't exercise four hours a day or go to bootcamps. She is not gifted with great genes or extra willpower. So how does she eat this way and still stay thin? Michele Connolly knows what it is like to deprive yourself of the food you love, and feel guilty every time you indulge. She's been there and done that. She knows how you can be distracted from the pleasure of dinner with loved ones because you're obsessed with what you should and shouldn't eat. She know what it is like to feel constantly unhappy in your clothes, in and out of them. Most of all she knows that feeling miserable about your weight is like a constant shadow over your life. But she also knows it doesn't have to be that way. Michele's warm and very funny take on managing weight loss is not only spot on in terms of weight loss science but is laugh-out-loud funny. 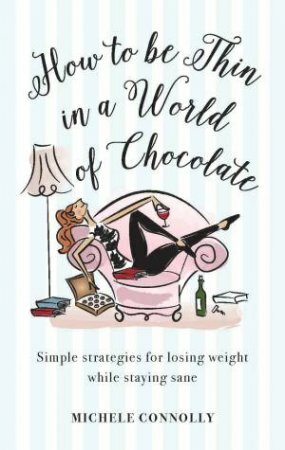 How to Be Thin in A World of Chocolate is the perfect gift for anyone you know who wants to lose weight but doesn't enjoy hours of exercise or is sick of extreme calorie restricted diets ... or sick of the word 'diet' in general!